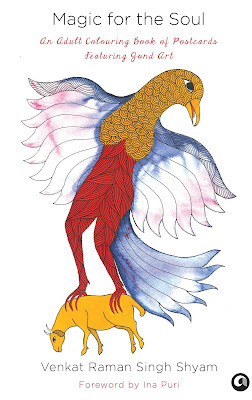 The marvellous art of Venkat Raman Singh Shyam are filled Chachan birds, the Katheli tree, snakes, animals, plants and other images from an illusory world of the Gond people. The illustrations in this colouring book will challenge and draw out the artist in you and will lead you to further explore the extraordinary world of Adivasi art. The trail of Venkat’s magical flute leads to an enchanted Alladdin’s cave of art that goes back to ancient times. His work is radiant and full of enchantment and it will take you over. I am in love with the recent trend of adult colouring books. They are so de-stressing that I have been adding them to my bookshelf in lots. When I received this book for review I was jumping with joy for not only is this adult colouring book beautiful beyond words but it also is in the form of postcards which can be later on mailed to your loved ones. One thing I observed about the artist Venkat Raman Singh Shyam through his collection of Gond paintings is the depth in his work. Though simple to look at , in the first instance they hold deep moving meaning within their bold strokes. I have really loved each and every painting and felt they have a story of their own to share personally. This is one book I would recommend as the most perfect gift you could give to any of your near and dear ones irrespective of their age and tastes in books. It makes the receiver feel special with its beautiful paintings.